The Ongoing Global Impact of the European Debt Crisis provides feedback from some of the nation's leading legal minds on the current and future state of Europe's sovereign debt situation and address the overall impact on U.S. markets. The experts discuss how they are recommending clients adjust their business and financial strategies, if at all, during this time of uncertainty. Since 2009, the European Union has been going through financial turmoil, and though it might not be top-of-mind as of late, global effects are still being felt. In order to fully understand those effects and successfully address the issue, it's important to examine contributing factors to the current situation. What major causes led to the European debt crisis? What role have European governments played in attempting to minimize the fallout? What role has the European Central Bank (ECB) played? What other entities have contributed to recovery efforts? What specific countries have been the most affected? What are the legal implications of the European debt crisis? What have been the global impacts of this ongoing issue, politically and otherwise? How is the unemployment rate being addressed in various countries? 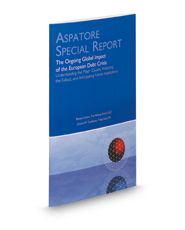 Additionally, the authors examine new regulations that have been implemented in light of the crisis. This report offers readers an on-the-spot look at this issue as it continues to unfold.